How do I simplify data access and decrease the reliance on expensive integrations and interfaces? BIAmart is a state-of-the-art data mart created to provide a simple way for the healthcare industry to capture clinical analytics information for real-time, actionable insight. It is designed to address the needs of users who want to discover meaningful data and have it presented in an easy to understand manner. Today, users are requesting easier and faster ways to discover relevant patterns and insights in data. Faced with growing pressure to drive optimal care efficiencies, they are looking for self‐service capabilities that allow them to perform data analysis from their desktop without the need to request and wait months for IT‐driven reports: our BIAmart data mart is the answer. With BIAmart, your organization can securely capture clinical data and give users timely and relevant information that enables them to measure and monitor quality, patient safety, and service line efficiencies for continuous improvement opportunities. BIAmart securely and efficiently gathers data using the accurate standardized and normalized sources of data including HL7, DICOM, and XML message structures. Captured data from Information Systems including your EMR/HIS,RIS,PACS and others is then shared with authorized users across the enterprise without complex interfaces and cost-prohibitive integrations. As an example, BIAmart captures, inspects, and stores all data elements associated with admission, discharge and treatment events, diagnostic tests, patient interactions and clinical treatments. Users are then empowered to create operational specific analytics for the purpose of analyzing performance and operational outcomes. All of this is accessed through patient-centered identifiers such as health card numbers, MRN and others. The information is easy to view, export, and construct into clinical analysis using any legacy or 3rd party visualization software. BIAmart enables Decision Support teams to work closely with clinicians to quickly answer clinical questions and identify trends drawn from data analysis. Bialogics BIAmart comes standard with Natural Language Processing (NLP) capabilities. BIAmart makes the most of its NLP capabilities by enabling healthcare providers to understand unseen trends or opportunities within their departments today. Through Deep Learning, BIAmart is able to conduct specialized quires in order to provide intuitive results to better assist support staff in the decision-making process. Data is easily accessed through an easily configurable, web‐enabled interface that allows users to select their own data analysis parameters from a drop‐down menu. Information from admission, discharge or transfer can be queried and cross‐functional data can be published as visual, real‐time analytics: BIAmart is designed to be flexible, giving users the ability to focus solely on the parameters they want to measure. Users won’t require formal data analysis training. They have the option of using built‐in summaries included with the product – such as the Bialogics Diagnostic Imaging application, third‐party specific analytical applications and the R analytical program – or they can easily create their own specialized summaries using the simple data extract and mapping services supplied. Variables can be added to the summaries at any time, as requirements change. Once created, data is presented in near real‐time, delayed only by the parsing process. BIAmart supports full interoperability across all data systems and can be used as an enterprise-wide solution to identify the clinically specific elements required within a defined business process. It is vendor agnostic and can export data to support 3rd party applications. 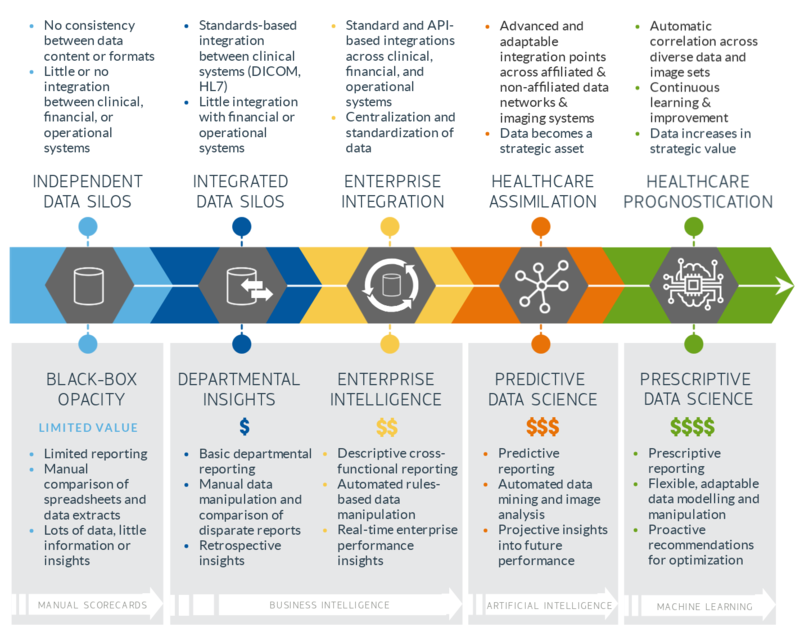 Designed to be cost-effective and simple to operate, BIAmart integrates into existing data warehouse strategies and enables the rapid development of clinical rich insights. By deploying BIAmart, you’ll remove the limitations of current data analysis practices experienced by most healthcare institutions. Instead of going back and forth through a complex data analysis process involving resource intense actions, your users will be able to simply select their parameters to automatically collect data and have it presented in an interactive, visual application to think through optimizations and make informed decisions. Is BIAmart a “self-serve” analytics platform? Yes. BIAmart was designed to be simple to use for any end-user and provides customization options so that each individual can focus solely on the parameters they want to measure. Does BIAmart provide predictive analytics? Yes it does. BIAmart uses models to present data for specific behaviours and actions. In addition, it also provides descriptive and the clinical information required for Prescriptive analysis analytics. No. While BIAmart can be implemented using its own single server hardware or into a VM architecture with all data archived locally, it is also available as a private cloud solution.